Firstly a round of the NW league at Bebington. On a course that couldn’t have been designed more for me unless they’d actually named some of the corners in my honour. Super fast, flowing straights, long ‘keep the hammer down’ corners and just a few surprisingly tricky off camber corners to keep you on your toes. In the dry it was utterly awesome fun. Next up, Otterspool. A name that sends shivers down my spine. I’m sure the place is cursed. The last 3 times I’ve raced there I’ve crashed the car, ridden face first into a tree, smashed a shifter and discovered, while trying to sprint off the line, that my chain was slipping over the rear cassette. It’s not that I don’t like the course – it’s got a lot of fun bits in it and I even enjoy the singletrack sections, it’s just that something always goes wrong. Annoyingly, this time round was no exception. Gridded up near the front, didn’t lose too many spaces in the start print, everything seemed OK then WALLOP! On my arse for absolutely no conceivable reason. No idea what my front tyre washed out on but I was instantly on the ground with about 60 people charging full pelt at me. How Andy Porter managed to not ride straight over my bike I’ll never know! All I could do was standat one side of the track and wait until every other rider had passed before reclaiming my bike fron the opposite side of the course, jump back on and set about chasing after the rapidly disappearing race. As the laps passed I worked my way up the field. Each lap getting harder as the people I was passing wanted to race me rather than just let me through (fair enough, given that we were racing for position!) and each lap getting me more and more worked up and angry. By the final lap I could see the top few riders ahead and managed to get myself up into 4th place, only to clout another tree with my shoulder. Hard. As well as bringing me to a complete halt it really bloody hurt and seemed to put a stop to my charge, I sat up a bit, which is a really stupid thing to do during a race and, unsurprisingly, Matt Lawton (who I’d passed to get into 4th) took full advantage and got back past me. 5th place. Not the disaster it could have been, but that curse is still in full effect! 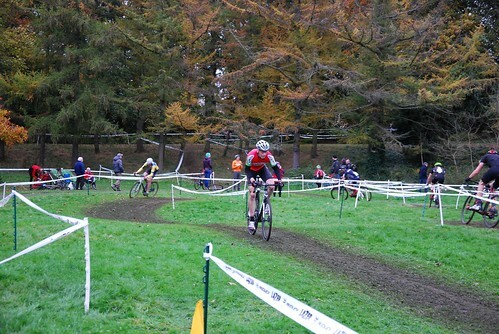 Last weekend didn’t have a round of the NW league, so I made the trip ‘oop norf’ to a round the North East ‘cross league held near Penrith (which I’ve never through of as being in the North East, but never mind that). 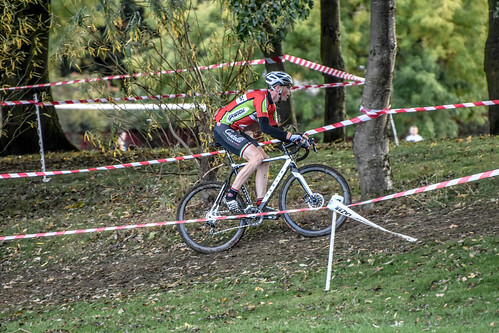 The course was similar to the Rossendale ‘cross race I’d done earlier in the season in that there were lots of rocks in the disused quarry hosting the event to avoid and an off-the-bike clamber up an unrideable slope. Unlike Rossendale, however, it was utterly bloody freezing. As in sleeting and snowing, with a horrible icy gusting wind. Proper grim. On the plus side, all the rain meant some mud to play in. Finally! The race didn’t go brilliantly. I just felt cold for the most part and really lacked any pace. Not wanting to puncture on the rocks, I ran my tyres really hard which made the muddy sections somewhat tricky, but wasn’t too worried about where I’d finish as long as both me and the bike got there in one piece. Thankfully I did, in 11th place in the end. Fine with that, not delighted, but fine with it. Glad I did it too, as you can’t train as hard as you can push yourself in a race (even one you’re not too worried about).